rocky's bru: Air Asia pulls out of F1? Air Asia, Malaysia's low-cost carrier, is expected to end its partnership with team Williams and pull out of the Formula 1. My sources said the cost has become prohibitive and Air Asia's boss Tony Fernandes has told some people that he felt the airline has achieved its goals where the F1 is concerned. F1's 2009 season has already lost the Honda team. In my piece Petronas should do a Honda, I said Honda wouldn't be the only one pulling out of the 09 F1There has been too few good news about the car industry since then. Toyota, we've read here, is facing its worst year in decades. Tony hasn't said anything on his blog here about the pullout, so maybe our journos should cucuk him. Bubarkan Keretapi Tanah Melayu,,buat Mass Rapid Transport for the whole of Malaysia,,baru orang kampong Salute Tony,,!!! Nak harapkan PM or TPM dengan angan-angan mereka nothing going to happen,,,Scrap all the Corridor Project,,,!!! rocky, any idea why that indian fella is pulling AA out of the F1 team? thats really funny. or unless that 'particular' transition of power thingy is somehow affecting AA in whole. or perhaps KJ should do a do too. All the UMNO's men and all the UMNO's soldier cannot put Humpty Dumpty together again. That was one of Mahathir pet project. Do Toyota and Air Asia know something...ordinary folks do not know? It's Singapore F1 ready to go...and no way...Malaysia can compete with Singapore. Air Asia shall pull out and support some local team sports..
instead of foregiener after all most their business are from local! Tony cannot afford giving hand-outs now! He is instead seeking for hand-outs .... first getting people to help him privatise Air Asia to hide his shame (and failing). Now getting govt to give him an airport with subsidised rates! don't ask tony, just ask his master. 13. AirAsia is heavily indebted. If it debts are not services, it'll go bankrupt anyway. aku tak heran kalau tony pulls out from air asia - macam patrick badawi cabot dari equine. afterall dia cuma proxy funder dia aje. you better find out this - AA are receiving their new airbus almost every month but the numbers of technicians and engineers remain the same. and AA don't allowed staff to form any union. aircraft just because the management want to make some profit. I wonder what happen in 3 - 5 years time on the safety aspect after each aircraft grew older. Nothing to do with F1 TONY ( To New York you heard the story? ) just bleeding and bleeding..
Don't you know temasik lost us $30 billion for the last 2 months they may have to close down their F1 next year just like their Marina bay casino..
Petronas should also pull out of F1 and spend the money at home instead. Why do we always give so generously to foreigners to the extend that we get conned all the time and yet when it comes to locals, we are treated like dirt. Look at Sabah and Sarawak. In spite of so much money is unfairly taken out of the two states, I have yet to see Petronas sponsoring charity works in the two states. But when it comes to foreign companies which are already very rich in most cases, Petronas is generous to a fault. Malaysians not good enough? Sekarang tony dah berjaya mengconvincekan sime darby untuk buat KLIA East @ Labu pulak. Perlukah kita ada dua airport berhampiran satu sama lain. Memangpun tak guna duit rakyat, tapi satu hari nanti, kena timba air keluar dari bot jugak. Salam Bro, I think Mr Fernandes should meet with Musa Hitam, Chairman of Sime Darby. Sime Darby seems to be interested in many things Malaysian like Golden Hope, Guthrie and lately IJN. So if Sime Darby really wants to diversify, they ought to be thinking about buying over Air Asia as well, after all they are in this talk about building another LCCT Airport at Labu, so makes sense if Sime Darby should just take over Air Asia if the latter is really in trouble. If MAS do not want to merge with them then we certainly do not want Air Asia to be bought over by SIA. Air Asia has built itself into a strategic Malaysian company with much potential, actually there are a lot of good that Mr Fernandes has done for us Malaysians, remember "Now Everyone Can Fly".When Air Asia is in trouble, Malaysia should help its own. all readers of rocky bru especially the anonymous ones. Yes we are considering pulling out of F1. In three years we have built a brand that is bigger than most brands in asia. Pls refer to top brands.So we are looking at pulling out. We have achieved what we want . Its a shame that the majority of you would like us to fail despite us carrying 60 million people who never flew before and us giving employment to 6,000 people . It is tiring trying to defend ourselves, we have done so much for the country and only recently after 7 years are we beginning to finally get a level playing field . If we were so strong why did it take us 7 years to get KL Singapore, why have I still not got Penang Singapore and other routes. On MAB we have made it very clear that we are being overcharged . we have compromised on prior charges pre budget terminal but we will be going into dispute on after the budget terminal . How in earth can anyone say we should be charged the same as the main terminal where the facilities are much better. We owe mab nothing, they owe us . On local sports we have sponsored Table tennis, football and individual athletes. But if we are to build a global brand we have to be on global properties. As for ex banker we have never asked for a merger with mas and we have never got a handout or any bailouts. Pls let the readers know what handouts we have received. If we were not good at what we did how have we defeated Tiger, Jetstar etc. How have we gone form 2 planes 75 and carry 20 million guests. And as for going out of business your note contridict yourself. Why would I be buying back the company if its going bust. Come one ex banker if we are going bust why buy he company back. As for unions no one in airasia has ever come to me to start a union because there is no need. We are one family. Our staff turnover is very low . If we were bad at looking after our staff there would be a union and staff would be leaving. We cant stop the formation of a union. Pls read the law. I am not hiding and am willing to answer any questions. Negativity will be the end of malaysia. I have said it in my blog and I say it again. We all have to change , we have to work together, change what is wrong and make malaysia a better place. When you see a company that has obvioulsy made malaysia a better place and some of the comments I read it saddens me. I have a wonderful 6000 staff strength who have done malaysia proud and we have struggled all the way. Nothing has come easy for us. Just ask the owner of this blog Rocky who knows me very very well. I am not hiding behind anonymous I am answering myself and am happy to meet anyone . I have a blog, everyone contacts me on email , mobile and when I am working around the office. I am even on facebook. I do hundreds of speeches to school kids ad universities to try and motivate them. We have developed boys who carried bags into pilots. And we have built a Malaysian company, Not an malay , chinese or Indian company. A malaysian company that has been successful because of teh fact we are maaysian. So to another anonymous I am malaysian not an Indian fella. I am born here , have a malaysian passport and a Blue ic. And Im proud to be Malaysian. I don't imagine I will change any of you but Malaysia needs change and running down a company that has done so much for malaysia is odd. Isnt Malaysia better for having Airasia ? If you really want to know me come and see me and I will answer all your questions. Rocky as mentioned to you. Im free anytime to do an interview and your readers can pose all the questions. But be brave malaysians and dont hide under anonymous . Thank you for reading, Wishing all of you a merry xmas and a happy new year. Temasek is losing money big time!! Retrenchment coming soon at cinemas near you.. This pull out means some others have burnt their fingers by partnering TF in some sponsorships. TF's company never pays up. Usually it only moots a partnership idea, then gets the partner to pay first and put in their branding as well, and then TF will spring THE 'SURPRISE' to say something negative about the deal. By then the partner who has invested cannot pull out and so foots the bill for the entire cost - including the one for TF's company. After that, they never want to deal with him. The funny thing is - they also never tell others about it, even if it is another GLC. So, now we can look out for another scape goat in the making in the Labu airport deal...in time to come. Some smart guy said, government will not pay anything for Labu airport - but then who pays for the regulatory bodies' manpower that will have to work at such airports? And if anything goes wrong there in future, this fellow will whine and whine to get out of the airport while SD will have to pay up in total. Meanwhile, the state government folks will have got their share of credits (nama sahaja...thats what I can say now) for lining up another airport closer to KLIA but in their state. Imagine, Subang, Sg Besi, KLIA, Labu, Batu Berendam.... and Ipoh and Perak cannot get any help to expand their existing airports. Penang - lagi teruk. Even when Gerakan was in power, not much funding to expand Penang airport - all because it was not headed by UMNO. Now Perak is experiencing an about turn. Funds promised earlier, now have been withdrawn? Alor Star can wait, and wait, and wait. Sultan Mahmud Airport in Terengganu has gone international already...and Alor Star is still waiting. And that will also be the end for Langkawi - which is in the state ruled by PAS. Maybe Mersing will have an international airport soon!!! Just wait for TF to spring that surprise in a few years time. He is very creative, in accounting and in other aspects too. This reminds me of another idiot who was so arrogant those days and who said that Kedah will have its own international airport, just near the borders of Penang. He later slapped someone's face at KLIA and had to pay up, to avoid losing his own face. What's wrong with pulling out of F1? I heard they also stop their sponsorship with Man Utd. It's all marketing to potential market. Keep it up. I'm looking forward to fly to London with Air Asia X.
Hahahaha... now eat your words ex-banker. Hei Rocky! Did you know that the international code of Air Asia AK stand for Ananda Krishna? Well now you know! I have been following most of the blogs and malaysiakini news portal since nov 2007 and I have also posted a number of comments,but now I dont bother much.The reason is because most commentators and bloggers are buzy with their criticisms and hardly stated what they have done for their needy fellow malaysians.Its all about candle light vigils, demonstrations and govt criticisms.No concrete plans or actions to help out those needy and poors in the many kampungs,estates etc.I am not saying that they should build a big company and employ malaysians but simple acts like forming action groups and visiting these poor malaysians and help them out with education,buying school uniforms,books etc will go a long way.This is not the case with all those champions of criticism.They(commentators,most bloggers and sure the politicians too)are apt at speculating things and criticizing others.It is definitely tiring trying to defend oneself all the time,best is to ignore and do the rightful things for Malaysians the way you deem it fit,otherwise you would be demoralised.I dont think the political scenario in Malaysia will undergo a dramatic change even if the opposition were to take over the helm of the govt,simply because I dont see the mental attitude of Malaysians in general and those who crave for a change in particular themselves have shown any changed mental attitude.I am sure I will be inviting some brickbats here but it doesnt bother me as my consciense is clear and as a Malaysian I have done my part though it may not be something to shout about.So do what is best Tony and be a good human,feed a couple of poor mouths and your creator will bless you.I wish you all the best. Thank you for responding to a small part of my comment. You said: "Come one (sic) ex banker if we are going bust why buy he company back." 1. What about the rest of my points -- or you can say my allegations? 2. Since you did not respond to them, I take it to mean that they are correct! 3. You asked me why taking AA private if it's not doing well? (d) If you are not interested to take AA private, why asked the banks to lend you and Tune Air money? (l) And if you take AA private and refloat it at a later date, I may buy your shares again. Well said. Lately, I don't like too what we have become. Ignore the doubters, the whiners and the bitter. Take your company to greater heights. And I hear you too, Dr Suresh. I cheer Air Asia. Proud that it is homegrown. 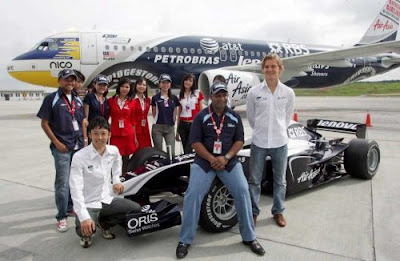 If Air Asia want to pull out from F1, then let it be. Air Asia must have their own marketing/ad strategy. Furthermore, their bussiness are not related to car/petroleum technology (unlike Petronas). On other hand, current issues with route/airport should be handled with "Malaysia" interest in mind. Be carefull and remember that not everything is bussiness. F1 is not Mahathir personal pet project. Mahathir have Malaysia interest at heart when he launch this project. Open yr eyes and you will realise the benefits. (or may be he meant he may want to sell Air Asia or even give it away for nothing)he has to stop day dreaming. Pariah Mahathir would not have given it to him for one ringgit. If it is any good why is Air Asia lost money this quarter ? Just you watch the fall of this budget airline, Tony must think he is the CEO of Ryan Air. Stop dreaming ! I will walk all the way to K.L. if he makes money even this quarter. See...A successful Malaysian.. have more than 6000 staffs....tells... "don't hide under anonymous"...still they do that...ignoring him completely. They never listen to good advise. Tony..I flew by Air Asia to Indonesia and Hadyai many times...and once.. directly to Jokja...and return flight cancelled...made so many flew to Jakarta ..wasted 6 hours total...no food given!! That was not the first time...but I made it my last time to fly by Air Asia. Please take note...I flew on full fare..all the time. I book all my tickets through travel agency. When you moved to your new Terminal...flying overseas mixed up with local flights...so call duty free shop...not really duty free at all!! And your checking counter staff .....so many so tough and rude...keep charging over weight bags..with no considerations...especially to uneducated first time..fliers. Planes are old and dirty. So don't blame fliers choose alternatives..where sometimes cheap is never good or safe enough. Tony has responded politely and intelligently to your negative highlights. He has also invited you to meet up with him and offered Rocky a personal interview. What's wrong with people like you who could never appreciate the brighter things in this country. People like us who do not have the means to buy up shares during IPO do appreciate the low cost fare that Air Asia has been able to offer us. I don't want pick a fight with you. I wasn't even fighting with Tony Fernandez. I was just trying to bring out the truth. Yes, AA has done a good thing for the travelling public and tourism. But it has also played out the government and Mas to gain an upperhand. Many good Mas rural pilots were played out when AirAsia FX "sold back" rural air services in Sabah and Sarawak to Mas after one year. AA bought Mas' rural services in order to sweeten its negotiation for route-sharing with Mas. I am trying to tell Mr Fernandez and whoever is interested that there are two sides to a coin. AA can be doing badly now. But that does not mean Mr Fernandez is poor. He has made his pile via the IPO. There are two components to any corporation. One is the wealth of the company and the other is the wealth of its owner. Many company had gone bankrupt with minority shareholders losing every penny they invested yet the majority shareholders (like Mr Fernandez) made tonnes of money from their IPOs and get to keep their private wealth. I am being practical. I don't want AA or Mr Fernandez to go bankrupt. But as an investor, I have every right to question the conduct and governance of AA and all public listed companies,especially where I am an investor. What I can't accept is people like Mr Fernandez who love media publicity but cannot take criticisms, and think that everybody is stupid and can be taken for a ride. ex banker must be congratulated to speak out his mind bravely. Yes...influential personalities..appeared humble...seldom accepts criticisms. L live to support smart and daring Air Asia...feeling so touched..so many poor guys can now take a plane ride...some FOC!! I flew Air Asia....even when they had ONE plane..at the old airport!! Fernandez should spend time...to check out my complaints. 'spies' to check things up!! And for ex banker...our country...small bank can buy up big bank...think about it. Ikan bilis can swallow......not eat ..much and chew.. buayas. sorry if i sounded tough. you may know more what's happening behind the corporate scene than the rest of us, and for the sake of good corporate governance, you have every right to voice your opinion. my wish is that we have more entrepreneurs who would develop business offering affordable services for the mass, and in my strictly personal opinion, mr. fernandez's effort in his venture has been inspirational for malaysians, the kind of business that would not rely on government contracts, but rather on a workable business model targeting the mass market. i was looking from another angle, you were looking from the point of view of a minority shareholder. Both of us can be right at the same time in our views. The points raised by "ex banker" and "river" are case in points about how corporate malaysia is being run. You have a middle class Malaysian enjoying the fact that everyone can fly now. On the other hand, you have an "insider" who knows how that middle class Malaysian's tax payment has been used detrimentally! Quite well articulated at this site that also appears to be a critic of Rocky. i have flown with your airbuses and i enjoy my in-flights with your crew, everything. why is it that the seat space is ultimately narrow and the legroom is limited? I really wonder whether does that come along with standard operating procedures on safety? not all asians are small breed mind you. secondly, why is it that we cannot even be served with a simple drink or something similar for short in-bound flights? do you know that the pressurized cabin is so dry that people get thirsty very fast? thirdly, could you kindly declare to public your company status as you in this blog, people are currently hurling accusations at your company's turnaround. fourthly, would it mean that after privatisation, the company would do better? please let us have your views. F1 is an expensive sport...but I like it. From what i gathered from their annual report, Air Asia spends up to 20% of its total annual revenue on advertising. This is a massive expenditure (even full service carrier is spending 5-10% of its total revenue on ads) - reason is simple - to build its "brand" rapidly. Over the years, no doubt Air Asia has successfuly build its presence and brand globally. What they havent realized is that they are now overspending on ads. You can see their expenses on F1, ads on main tube stations in London, joint-promo ads (with Tourism Malaysia) elsewhere, etc. Its good that they are now cutting their budgets. However, TF being an egoistical confident spin-doctor, will find it hard to admit that they have overspent. Simple as that. What you will hear is something along the line of "oh we have built enough global presence". This is typical TF. You can't even get plain simple truth from TF. Even the stories on Air Asia's fuel hedging policy were not consistent. During the quarterly analyst conference call, the call to Air Asia by more than 30 global analysts lasted for 30 minutes - it showed no confidence on TF leadership + stories. Very dodgy.